It is well suited for all types of project management. It is able to absorb and extract data in many forms. Aha! 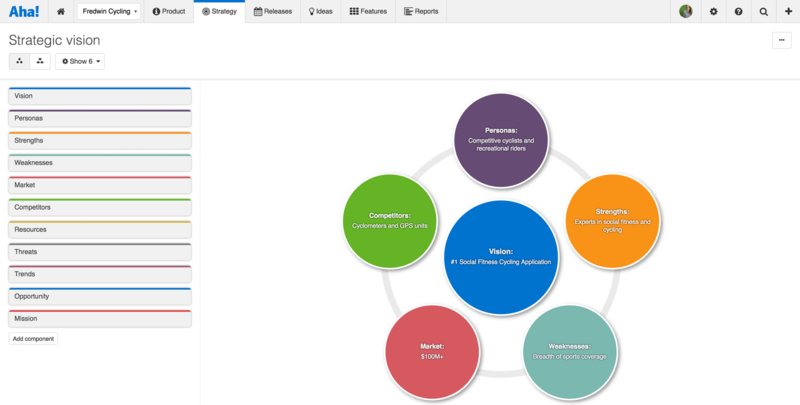 is an all around product management suite. It is great for breaking product plans into initiatives, features, and user stories. This helps the organization understand the product plan and what is driving individual work items. Unlike Jira and project management tools, it helps you prioritize by major themes, features, and releases. Once you start to use it, you can't go back to a project management tool because the views for organizing and prioritizing features just isn't there. Aha! also excels at idea management. You can create a portal for users to submit ideas and manage them through a workflow. Users can submit ideas through a variety of channels, including email, ZenDesk, and SalesForce. You can even attach account values to an idea submitted through SalesForce, though the UI in SalesForce is a little kludgy. This is a great feature for those that have the capacity to manage feedback this way, but be aware that it takes time to manage. Aha! works pretty well with Jira so that project managers can have their backlog that is understandable to the business and engineering can break down those work items however they want. Aha! also has a lot of useful integrations: Slack, ZenDesk, Zapier, etc. It also integrates with every major software project management tool on the market: Jira, Pivotal, Rally, Redmine, and TFS. We love the agile capabilities in Workfront. The tool does a great job of combining agile and traditional task management into a single tool. Workfront Request Queues provide an easy way to manage and route requests ensuring that the right people see and act on requests. Workfront reporting allows to automate project status reporting without having to write a separate status report. We enter project updates directly into Workfront and then use scheduled reports to deliver information to stakeholders. There are a few catches once you get down to using it. For example, Aha! maps products to projects as a one-to-one in Jira. Why should anyone care? If your Engineering team is organized into functional groups that work on more than one product, this can be a mess. You can't send features to two different teams for one product. Other products like Wizeline support this. Idea management can be overvalued. Be sure you need it before you make it a must-have feature. Idea management is great for enterprise B2B companies with a small base of users to support and the development capacity to be responsive to ad hoc feedback. Think a closed beta participant group, a CAB or small disciplined internal user group like Customer Success. However, it takes a large PM team and excess capacity in Development to manage this sort of feedback. Otherwise, you set yourself up for failure. Look at Aha! 's own idea portal, and you can see it takes a large PM team to track everything, and even then, the user community has to accept that there isn't going to be an immediate response the way a service desk would respond to a problem ticket. If this functionality is not key, there are other tools like User Voice that can be purchased separately later to provide best of breed feedback management. The SalesForce integration is not as useful as we thought. My Sales Team found it unusable because of kludgy UI issues. Also, it was hard for users to pile on with other accounts needing the feature, so it only represented one ask from one account, not the market. Plus, it can be totally random which sales person speaks up, leading to a squeaky wheel effect. We found it easier to run this kind of analysis through our web analytics tool, Woopra. Any major account requests were just handled the old fashioned way. We did not use the strategy or roadmap screens as much. We really just needed a wiki to store this info. Old fashioned PowerPoint and tools like Product Plan can cover this as an alternative. Our core usage centered around the initiatives, the product backlog screen, and the reporting (for the roadmap as opposed to the actual roadmap page). In terms of what Workfront could do differently or improve, the poser of the search features is in their ability to gather any type of data within the application. Results can occasionally be dense and could use the ability of applying a second level of filtering. Adding in constraints of variables such as date or job could be very helpful in reducing results and saving time. Certain features such as projects specific data might benefit from the ability to take them offline in small quantities . The functionality is there, but it's intimidating to learn. I have witnessed users with a PMP background pickup the tool and use it to its full capacity within a week with very little training. Users without basic project management skills, however, have taken much longer with extensive one-on-one training. The tool is highly intuitive if you have a PM background. Reliable uptime with posted maintenance windows. Frequent updates to hosted environment with minimal disruption. Support always answered in 24 hours for any inquiry-- a reasonable timeframe for most of our requests. The PM team participated actively in supporting their features, keeping them close to the product. It would be nice if the support forms were more dynamic so you could add more information to the support ticket when you enter it to reduce back and forth with the support team member. Also communication on escalated tickets isn't always great. It's gotten better over the years but still needs improvement. Other than that, initial response on support tickets is really quick and the people I've dealt with have always been very professional. The training is very easy to use and you can simply choose the topics included in the course(s) that are most important to your training needs. After each training course, you are tested on what you have learned. If you need a refresher course, they provide Course Catalogs as well as instructor-led courses & workshops. I would recommend all user's using Workfront to go through the training material provided. Have all user's practice in the Sandbox environment and have your workflow documented for the consultant before he arrives on site. We reviewed 7 other project systems when we were reviewing systems to use. We decided to use Workfront 7 years ago. I don't remember the other systems we reviewed but I do remember that were we especially impressed by the customer service and responsiveness we received from our first contact with Workfront (when it was AtTask) as compared to the others. Our questions were answered immediately and testing was easy - so the fact that we were speaking to many other representatives for each of our systems we were evaluating, after the features we needed were identified, it was easy to see who stood out from a customer service perspective since we were interested in the proper support as we went through the process of using a project management system. We have been using Workfront for about 3 years. During this time they continue to be a very stable project management system. Workfront's overall scalability is able to handle increased loads of work. When using Workfront for a project management tool for the web team, we store documents, images & video's without any issues. They work with their customer's to provide the best project management system in the market today! 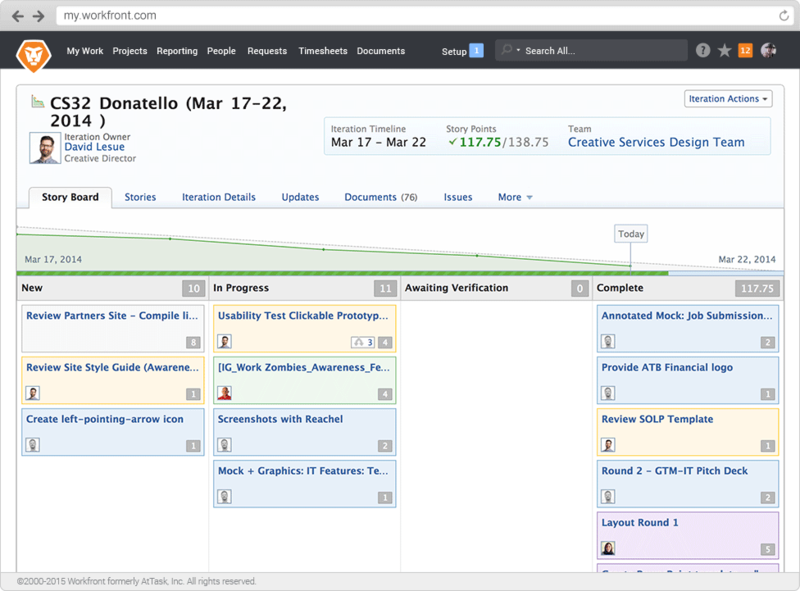 I highly recommend Workfront for all project management needs. Workfront strives to deliver unique technology solutions to growing companies! We are still within the first year and have yet to be able to measure ROI specifically, but the broad team has been really supportive of the adoption. There is clear potential in Aha to be used more broadly than we do now, and we have already expanded it's use into other parts of our Product Team. The integration work is the current roadblock, but once that is ironed out with the help of Aha support, we should be good to go. Workfront has impacted our team and individual accountability for accuracy on projects. Workfront has helped keep us on deadlines and timing for projects. We meet our deadlines 100% now that we use Workfront. Workfront has helped us eliminate errors on projects by 80% so we don't have to do them over.